Facebook user shares his experience and asked "Why there are many abusive towing officers in Manila? ", after he had experienced a traumatic horrifying scene to an officer from Manila Traffic and Parking Bureau (MTPB) yesterday (July 25th). 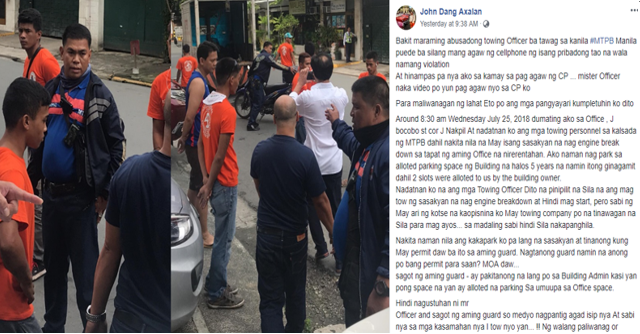 According to John Dang Axalan, the anxious netizen who was questioning is it legal to forcely get his mobile phone while taking photos and video of a certain event most especially for documentation of a scene which involves protecting his rights and himself. The scenario was, Axalan arrives at the building he was working with and he saw a group of MTPB trying to tow a vehicle which was according to him had an engine breakdown. The officer who was in the video Axalan uploaded wants to tow the said vehicle eventhough the officer and his team was notified that the owner of the vehicle who had an engine breakdown already called a private towing service. Then when the officer was advised so, he asked the security personnel in the building if Axalan's vehicle have a permit to park in front of the building he was working. The security guard told the MTPB officer to rather ask the building admin for his concern. And then suddenly, when the officer dislikes the response of the guard he shouted and asked his team to tow Axalan's vehicle. Axalan was notified right away by the security guard of the building and he told the MTPB officer that 2 slots in the building is really alloted for people who lease in the said property. However, the officer was not convinced the way Axalan responded on him that's why he shouts and command his team to tow Axalan's vehicle. Mr. Officer ano po ang violation? Axalan said. The officer said, "Illegally parked po ang sasakyan niyo." "Alloted parking area kase yan ng building para sa amin at 5 taon na po akong nagpapark diyan." Axalan responded to the officer. And then the commotion started because the MTPB wants to tow the vehicle of Axalan who according to him his car is legally parked. Axalan decided to take a video and photo of the scene to make sure that he has evidences, however the officer in the video wants to get his mobile phone and even his team already is harassing him to get his mobile phone. Only the security guard did approached the arrogants MTPB officers team and did tried to get Axalan's phone. When the second officer came in, that's the only time he hands in his mobile and the Officer 2 requested him to delete the video and photos. That's the only time, confused Axalan seeks answers to his question if it is really legal to get his mobile phone during this kind of operation from the MTPB? And furthermore, he discovered that the said vehicle who was parked in the sidewalk of the building that was covered and with sticker that the MTPB ignored towing was owned by a Korean national who happens to pay P3,000 in the municipality of Manila. Well, as of writing no less than 24 hours it was posted by Axalan it garnered 28,000 shares from netizens and different reactions. Now calling the attention once again of government officers in charge of this scene, may Axalan seek answers to his question is really legal what this so called MTPB people doing to motorists whose vehicle is legally parked? Are there any legal documents to be presented first before towing motorists vehicle? Wherein the video seen, no papers or so was presented to Axalan before the MTPB officer commanded his team to tow his car? Please enlighten us!